Panda Security was founded in Bilbao Spain in 1990. It was the market leader in Spain which then inspired the company to offer their products internationally. Currently, Panda Security offers its services to 80 countries. Panda has been offeringsecurity solutions for more than two decades now, and thanks to innovative developments, Panda remains one of the top names in terms of online security. Among the best features of Panda antivirus is the blocking of malware and malicious websites and the program’s newly-added special features. Panda Security Pro 2018 (from $30.79/ year). This Panda package gives one device protection from viruses and other malicious threats by allowing users to browse the Internet safely. Panda Internet Security 2018 (from $38.49/ year). This package offers advanced protection for one device, allowing users to not just to safely browse and surf the Internet, but also to share and download files without threats. Panda Global Protection (from $53.89/ year). 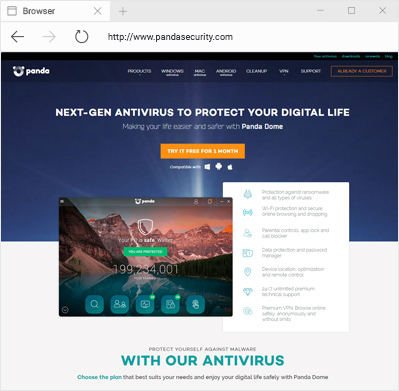 Considered as the best buy among Panda packages for home users, this package contains the same features as Panda Security pro 2018 and Panda Internet security 2018 plus computer system optimization, zero-risk online shopping and payment and powerful parental controls. Panda offers a very easy to use interface, allowing users to conveniently use the program to preserve Internet safety. Gamers will be happy to note that this antivirus program offers an on-off switch that delivers responsive connectivity, which allows the program to run silently in the background without causing any disturbances to the user. Thanks to the program’s highly intuitive and easy-to-use interface, even non-techy users would be able to run scans just fine. This antivirus program also offers a lot of control for the user. Similarly, installation is a breeze; users will definitely be able to install the program without any kinks. AV Test has run tests on Panda antivirus programs and have released results demonstrating the program’s high virus detection and removal rates. Small wonder that Panda remains to be one of the best antivirus providers in the market. Panda antivirus programs are also highly dependable for use with different devices such as PCs, Macs and Android smartphones. Panda offers different options of resolving customers’ issues with using the antivirus program packages. On the Panda website, there are sections dedicated for step-by-step instructions to achieve resolution on different concerns. The website also has a forum where users can go to get insights from fellow users and from Panda expertsregarding the program’s features and how common issues are resolved. Users are also encouraged to get in touch with the Panda team of experts for their concerns by submitting an issue ticket through the Panda website. Users can also call the Panda support hotline during office hours. Premium support users have the option get remote support, or chat with technicians 24/7. While some users would opt for a free Panda antivirus subscription, they would want to go for the paid subscriptions of Panda due to the program’s many special features. A pro Panda subscription also gives users faster scan times, an interface that is more intuitive and easy to use and a more effective performance. Plus, the program’s anti-theft protection features will definitely be worth the subscription fee that users will be charged with. Safe Internet Usage. Panda antivirus packages contain Windows protection that includes Wi-Fi protection, a firewall and even a rescue kit. These features are ideal for users who love to browse the Internet. Real-time Protection. Panda works in the background to make sure that your computer system is free from infections and threats. It does not take much of the system resources, so unless there is an issue that requires your immediate attention, you would not even notice that the software is working as you do your work. Online Backup and Parental Controls. This allows users to protect their children and their system from possible scams, phishing attempts and other vulnerable spots the system may have. Parental controls also allow parents to set up their own security level, so they could control their children’s Internet usage. Ongoing updates. Malware and spyware continue to evolve, which is why the Panda team never stops in updating the antivirus program in order to make sure that the computer system is always protected. The application keeps malicious threats at bay, while allowing users to safely scan USBs for viruses. Android Mobile Security. Panda boasts of this innovative feature that does not just allows users to boost performance and remotely locate, lock and completely wipe their respective devices, but also to prevent physical theft. If your passcode has been entered incorrectly three times, the device will take a photo of the person and send it to your email. It also has a feature that will set off an alarm when someone tries to steal it without first entering the passcode. Overall, Panda scores high in terms of protection against spyware and malware. The Panda antivirus program that has undergone the AV Test has gotten a 905 rating, which is higher than most antivirus applications. Panda is also very effective in detecting threats and corrupted files from emails. Panda is the perfect all-around antivirus software, especially for families with children, because of its very effective parental controls. Add to that the robust antivirus and antimalware tools that the program has, plus the responsive support you get from the Panda tech team and you surely have a very effective protection software for your computer system.